one of the nicer boxes on the market for pen display/storage & is truly solid wood where most are press board with wood veneer or photo finish. the groves that the pens sit in are also wood, from the pictures I expected a felt or velvet of some kind.....the real wood is much nicer and really shows the quality of the piece! I may buy another! 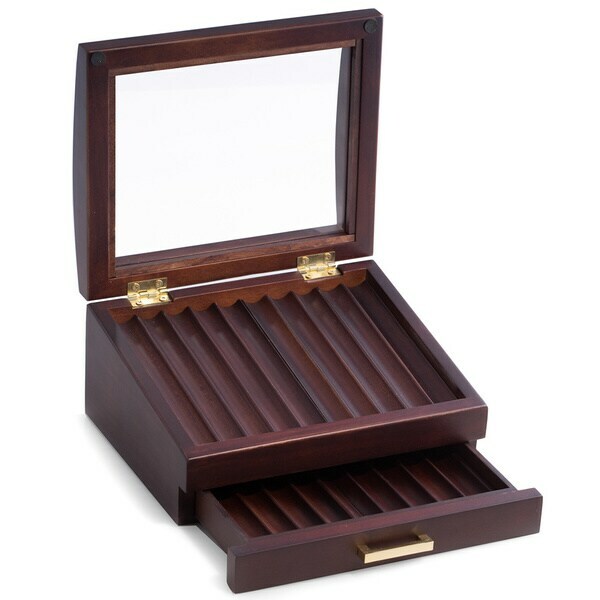 Display your expensive pens and keep them in a single storage unit with this well-made 19-pen box. Designed with a see-through glass top and an extra bottom drawer, this sturdy walnut wood pen box offers plenty of space for your pen collection. It is smaller than I thought it would be, but it does the job. It is very nice looking and is a great way to display my pen collection that was in a drawer for over 10 years. The box is light but sturdy. The wood and craftsmanship is beautiful. No regrets! This was purchased as a gift and I was very surprised that the quality was equal to the specialty stores that carry high end gift items such as this. I expected it to be larger since it holds 19 pens, but was pleased at the compact size. It's useful if you have many pens in your office or house and it's a good decor on your table. I gave this item as a gift to a friend and she loved it! This was a little smaller then I thought it would be but still made a wonderful gift! Great product. Will continue to monitor and report on integrity of materials used to ensure product quality. Decent quality! My boyfriend loved it! Because my silly and funny husband likes pens. It looks nice. I hope he likes it.